I have a 5-year-old smart child. He does his homework as neat as he can. Yesterday, he stayed up for an hour doing 3 pages of homework as good as he can and today when checking his copy-book, I found that his teacher had erased all the 3 pages and wrote a note on each page (do your homework neatly). Is this the right way of checking a small kid's homework, and if not, how am I supposed to act? I attached one of the pages. In response to comments: The teacher replied that he has to write on the lines not off lines. I went to the school and tried to meet her, but they said it's not allowed during school time, so I had a meeting with the coordinator and the school principal who both insisted that this is the right way of correcting the homework and said that it is better than marking all the homework with red and crossing it out for him. I certainly believe that erasing a kid's homework will cause a negative impact which already happened, he cried when he found it erased and asked "why do I have to do it all again?" This teacher is carefully producing a future math-hater. I've worked with enough high school students to know. I've also worked with enough people in personal counseling to know that whether you care to face it or not, this sort of work is NOT accidental. This is a deliberate, even if unconscious, effort to sabotage your child's learning. At that age the MOST important asset your child has school-wise is a love of learning. Nothing can substitute for that. A teacher who will destroy a love of learning in pursuit of a perfectly written piece of homework—entirely invalidating the careful hours your son put in to do a good job—is valuing form over content to the point of insanity. One could also say it is valuing mechanics over purpose; whatever you call it, it is totally counter-productive. Personally, I value my son highly, and I respect his rights and dignity as a person. I would remove him immediately from the influence and power of this teacher. When I was very young (about 8 years old), my parents sent me to a new school. It was supposed to be an excellent school, with an excellent curriculum, etc., etc. I only went for a semester, and then (to my relief) I went to another, smaller school where I enjoyed myself much more and where, even though the curriculum wasn't as jammed with "high value subjects," I learned a lot more a lot faster. And had more fun. I subsequently finished 4th, 5th and 6th grades in the same year, and went on to graduate High School (12 grades) by the age of 13. Years later, talking to my mother, I found out why she had taken me out of that prestigious new school after only one semester. It was because she found out I didn't like going there. That was the only reason. You know your child. You care more for your child than anyone else on the planet, and you know what is best for your child. Don't let anyone tell you otherwise. If you don't like the approach used by that school, don't let your child be subjected to it. I am a retired teacher and I am shocked that this teacher felt that was appropriate. I'd start by talking to the teacher -- but you hang on to the papers. IMO, and probably the vast majority of parents and teachers, we are trying to build up children and encourage them into enjoying the learning process. We are not there to tear them down. If the teacher apologises -- keep an eye out, but you're done. Let it be a lesson for him or her. If the teacher doesn't 'get it', please take the pages and make an appointment with the Admin. It's fine if the teacher attends because you have no reason to lie or exaggerate. Your gut feeling that this is unacceptable behaviour by the teacher towards a primary student is exactly right. Even if your little darling is a handful in class -- it doesn't excuse this. I don't want to defend the teacher's actions. They were wrong, and overly critical and harsh. However, this is only one snapshot, one look at what should be "a whole". Maybe it was a particularly bad day; maybe the child has a problem following instructions, and the teacher has tried again and again to get him to follow instructions, and snapped. She should not have done this. But the first thing you should do is talk to the teacher in a non-defensive or non-threatening way to find out what was going on when she did this, and then listen. You'll learn a lot about the teacher from listening to what she says. You might find out she's not suited to teach young children. You might learn she is already sorry about her behavior. Who knows what you'll learn, but you'll learn something! Then act on what you learn accordingly. Please be aware that if the teacher is an authoritarian type, being overtly confrontational with her will come back to haunt your son unless parental input is highly important to the school. If she is an empathy-deficient authoritarian, I'd say help your child with his homework and help him to learn that sometimes people are wrong or unkind, and help him to deal with that. To let him know that it's not him, that he's a great kid, that he's loved will be important. If he goes on with his education as far as I have (22 years of formal education, 3 years of residency, decades of bureaucracy), it will be a valuable lesson. These kinds of "teachers" are not rare enough. When your child is at school the teacher is in loco parentis (literally "in the place of parents"): meaning that they should treat each and every child as if they were the parent, nurturing both their educational and more abstract needs (emotional etc.). This is not a role for everyone, and teachers should be held in great esteem for what they do, as it is a calling, not a job. Now in regards to your particular case: sounds like the teacher needs to leave public interaction to those with their full faculties. A small comment would have sufficed, along with praise for the neatness of writing (which as stated elsewhere is neater than that which some of us have to deal with from adults); the comment needn't even sound like a negative, phrased as a challenge, striven-for endeavour, or aid for the teacher it can help the child to reach for the goal. To give an example, one of my kids, when younger wanted to make his grandfather a tool rack (he was 4 at the time, my son, not the grandfather! :^) so he took some scrap wood, cut it to the width of the hut door, and screwed expensive brass screws into it for the tools to hang from (intended for another job) as they looked "nice for his granddad". He was praised by everyone for what he had made and especially for the thought behind it, and we told him to let us know next time, so we could "help" and learn how to do make it too (i.e. ensure that no needed expensive items suffer in the pursuit of their efforts). make the teacher apologise to your child: we cannot tell our children to take responsibility for their actions if they cannot see adults doing the same, my children have received apologies from various teachers over the years when required, some willingly and with great sincerity, some not so much (that would be the difference between a teacher who teaches as a vocation and one who does it as a job with great holidays). and then, pursue the school to take formal remedial training steps for the teacher: perhaps they are not suited to teaching a 5 year old, and may be better served by changing roles. like all of us I am fiercely protective of my young, and do not tolerate slip-ups well. Sometimes, the mere act of standing up for your child is just what your child needs: that you are unafraid of anything in their defence and back them unequivocally (knowing that you have their back in more slang parlance). At 5 they already thing you are like a god and there's nothing you can't do, and the groundwork now will mean that as they hit the more troublesome ages ahead they will trust you fundamentally. Addition to 3rd point: if my children are in the wrong I leave them in no doubt that they have been wrong, however I have also supported them when the repercussions moved from being just to punitive: we want our kids to know right and wrong, even when dealing with how to deal with fault; that shouldn't mean though that being in the wrong means they have to take whatever is dished out to them. I would keep an eye on the situation though, just in case. As a parent we can make mistakes, but erasing work done should NEVER be done on such a scale: some adults would find comparable scale erasure of their work soul-crushing, and for a 5 year old it can run the risk of devaluing the whole learning process in their mind. You say also that it is a pre-school teacher: not sure where you are from, but pre-school "teachers" as a term can include what amounts to glorified babysitters as well as properly trained teachers: I would make a point of finding out which it was that did this to the homework (though in this instance it sounds like the actual teacher). But no, utterly inexcusable and disgusting behaviour for an adult, let alone a teacher. I assume that the red writing was done by the teacher. This would make the entire page a form that your child was supposed to fill in in a very specific manner. Each cell with a red dot was supposed to be filled with a single digit. You will notice there are three pairs of two columns with 10 rows each. Plus one header row filled with Ts and green Os. The T presumably marks those columns as Tens. While O should stand for Ones. (Edited after some helpful comments) The expected solution would be to fill the numbers 1-30 into that form so that for each row the unit digits match, while the tens are filled with 1 and 2 respectively. Notice that first column pair only has the last row marked with two digits, clearly that's where the 10 is supposed to go. Thus the systematic nature of the decimal system would be revealed/presented in an easy to memorize pattern. Presumably this systematic and the instructions on how to fill in the form where the subject of the lesson preceding this homework assignment. Clearly your child did not follow this pattern, thus negating the intended learning effect. Also writing more numbers "wrongly" does not make it any better. Erasing the misguided solution in combination with the instruction to do it again neatly, could be interpreted as: I don't want to draw the grid again, so lets erase this so that you can fill it in again, this time following the prescribed pattern. It is debatable if the expected mode of solution was ever presented clearly to the children or if it was lost in the retelling. In my experience instructors often have a quite definite and also narrow definition of the desired solution (usually with a more or less sensible didactic reasoning behind it), but often fail to communicate their expectations clearly and understandably to the children. A point in this direction would be the use of the word neatly. While the expected solution certainly would be neat, it communicates in no way that the numbers should follow the pattern as indicated by the dots. On the other hand it is also true that many pupils do not listen quite so carefully and attentively when it is time for homework assignments. Addendum: It is certainly valid to question wether the combination of the task, the given instructions and the expected solution is suitable for 5-yearolds. Simply the fact that the desired solution was not immediately obvious to apparently quite a lot of adults here, seems to indicate that it was not. Also erasing an entire homework without comment does not seem ideal. But I'd like to stress that we do not have the verbal instructions that hopefully went with both the initial assignment and the instruction to do it over. I highly doubt that a 5-yearold is capable of reporting back any instructions he did not fully understand to his mother. Which again seems to indicate that the task and the expected execution where unsuitable. My primary critic with the other answers is, that every one seems to think that the teacher must be at fault, because the child did not understand (or listen to) the assignment and the mother guessed wrong from the (admittedly sparse) written instructions. Speaking to the teacher is certainly the right next step. But instructions to hold out for an apology and securing evidence to prepare for complaining to the administration seems like quite the overreaction to me. I think a large concern here that has not been brought up is the destruction of evidence of progress. Even if your child should do it again, and even if they do do better, they will have no way of knowing they did so because the Original work does not exist anymore - problematic because one of the primary motivators at that age is visible progress. I sincerely question the pedagogical methods of this teacher on those grounds alone. I would agree with you that this is not the right way of checking homework of a 5 year old. It can be very discouraging to the child. I do not think the teacher should erase the homework even if the quality of work was not great. Which is not the case - looking at the photo the work is done very well for a 5 year old. The other thing is of course talking to the teacher. Do the children have to use pencil? It seems so much better if the teacher just suggested to make another exercise if they believe the child needs it. It would not feel to the child as their work is wasted. If this is pre-school, his teacher may not be an actual teacher that completed an elementary education, or early learning course. Many pre-school teachers that work in day care centers are very well trained, take course work on early childhood education, and may or may not be currently enrolled in a college level course. Some, however, are (or at one time were) just enthusiastic about working with children. Start by asking which teaching methodology encourages erasing the child's work, and ask how this helps them achieve the goal that the homework was trying to achieve. You'll either get a good answer about a teaching technique, or find out it was an arbitrary and incorrect choice. While I don't think that the erasing by the teacher is the best policy, I feel that you are overreacting. It would be enough to explain your kid that sometimes disagreements happen, and that although the teacher didn't act in this situation in a way you (and him) like, she still needs to be respected. I would also mention to your kid what was wrong with his homework. 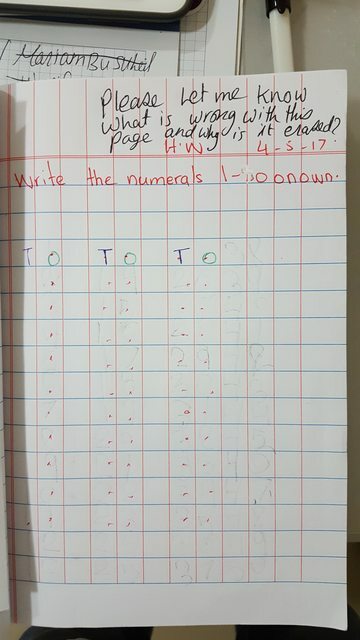 While, like I said, erasing everything is not a good idea in my opinion, it is important that you son understands in what way he didn't comply with the homework requirements (which, it seems to me, was to write each group of ten numbers in one column, and it was probably the main goal of the exercise). Your kid has a better handwriting than I and many fellow software engineers I know. Furthermore, the instructions are unnecessarily terse and hard to decipher. Not to mention the abysmal handwriting on the instructor's part. I'm a 28 year old native speaker and I can't, for the life of me, figure out what "Write the numerals on own" is even supposed to refer to. That teacher is clearly unfit. This is most definitely harmful. Marking a student's work in red ink is one thing (I'd personally not recommend using red ink below the middle-school level, but that's a debate for another time), but destroying the work altogether by erasing it is a completely different story. The teacher is giving the impression that the work is completely worthless, which would destroy your child's self-esteem. I can only suggest that you escalate this to the local school board (if applicable) and get your child moved to another class, and if that doesn't help, transferred to another school ASAP. If the administration says this is the right thing to do, than the teacher is probably just following school policy and cannot do anything about it without risking getting fired. I can feel your frustration, Dina. Though I am not a parent, my advice to you would be meeting with your child's teacher and reason with this teacher. You can bring up points, as you mentioned above, like 'he feels his work is wasted' and can say your child has been working hard on it. Best of luck, Dina. Firstly, don't assume the teacher erased the work. Teacher's aren't (generally) that stupid. I read the teacher's comment in entirely the other way - the teacher found the pages had been erased and wanted to know what was wrong and why they had been erased. I suspect your child found they had completed the homework differently to the other children (who likely wrote only the numbers 1-30) and so they erased their work so they didn't get it "wrong". That's a fear of failure on your child's part, and certainly not a "growth mindset". That's what you should be discussing with the teacher - how to allow for "failure" in a positive and supportive way. Read some of Carol Dweck's work, and share it with the school. You know, it's probably worth these questions being tagged with their country of origin lest people think these events are common in teaching, or that the suggested approaches are suitable worldwide. Erasing homework in general is not helpful, it denies the actual work a child did and doesn't allow them to see their progress. This is not appropriate behavior. Additionally, there are two things I noticed that I haven't seen mentioned in other answers - the reply you were given states that the problem was "not writing on the line" - well, no, actually several of the erased numbers do look like they wrote on the line. Looking at the picture, I can pick out (and be pretty certain of) the nine of 29, the one of 16, the seven of 17, and the four of 41, and a few more that are a little hard to be sure between the poor visibility from the erasure and what I can see from a picture. Erasing the "correct" or nearly correct efforts indiscriminately along with the ones "not up to standard" is - not helpful, it doesn't show the student what was right, or even what was better than another effort, leaving them to wildly guess at what would work or not work. The second point is, the numbers I can make out are sometimes above the line, sometimes a bit below the line, and sometimes on the line. Precision versus accuracy, but it doesn't look to me like the teacher is demanding something that is actually possible at this point. If all the numbers had been written the same or nearly the same in respect to the line (all centered in the boxes, all above or all dipping below the line) it should be possible to move that precision to the accurate position, that is neatly on the line itself, and some instruction to do and/or penalty for not doing so after warnings might be reasonable since they seem to have the skill needed (though erasing already-written homework is still not a reasonable penalty, in my opinion). That is a response for a student not doing what they know they should. As it is, it doesn't look like something he can reliably achieve yet and thus not a good subject for demands. He wrote as neatly as he could and still the writing didn't line up exactly, which is exactly to be expected of someone still learning the skill. It would be good to help him develop this skill, possibly including extra practice or marking that calls out the behavior so he can be aware of room to improve, but it is not good to penalize him for not showing a level of skill he doesn't quite have yet - and I count destroying his work as punishment, especially since numbers that seem correct were also erased. Also, it is worth noting (even to the teacher when or if your speak to them) that their writing is not up to the standard they're fussing over, either - the T and O of the last column are both above the line, and the w's and a's of the assignment dip below the line they're written on, not to mention the corrected number that might-be-three-might-be-five or the missing spaces where they ran out of room. They are not modeling the correct behaviors themselves, for their students to see how it is supposed to be done. Which just reinforces to me that the level of accuracy they are demanding is not reasonable for this situation. If they aren't following it themselves, then how can it be important enough to destroy someone else's work over it, except as just a power play. It might, might have been appropriate to erase what was written on the page if the assignment had not been done and clearly not been done intentionally (say, writing the literal phrase "the letters 1-50 onown" once and nothing else, or similar attempts at loopholes), since in that case the result was, and the message correctly was, the work assigned has not actually been done, and it does have to be done. But it was not appropriate to erase hard work for the "wrong" of the child not having more skill than they had, and additionally without good clear feedback on what was or was not "good enough" work or how to improve. The message should not be "the work has not been done" when it was, and the message actually needed to be, "more work on this skill was needed, here's how to improve". In this case, it's the teacher's work not being done. What you can do? I would suggest going to talk to them again, and bring up that the teacher's actions don't seem to be working towards their goal. The way to improve accuracy when writing is by highlighting where it was correct, which includes not also erasing correct numbers, and encouraging the student for showing improvement over time and with practice, which obviously cannot be done with erased work, and teaching techniques that will help and working with the child when practicing, which simply erasing their work and leaving them to redo it all on their own does not do. A child does not learn to improve their skills (especially motor skills) by being punished for not having better skills. I think it might help in such a conversation for you to point out how feedback (rather than erasure) can help your child learn what they need to do and/or not do in assignments, rather than trial-and-error guessing - and include the little details like the erased numbers were correct or the helpfulness of being able to see improvement. It can help to have the conversation be about a "miscommunication" or a better way to achieve the teacher's goal, rather than arguing why they were wrong. I mean, the teacher was in the wrong, and between the teacher's actions and the administration's lack of response, I would not trust that school easily - but it might be a good idea to try and work with the school and teacher first, in case there might not be good alternatives available for now and to keep them from holding a grudge against your child, even if it means letting them save face when wrong. You should, however, let your child know the teacher made a mistake, even if you can't get the teacher to admit it. Whether or not the homework was erased or entirely marked in red the assignment would have to be redone. So, there's an important lesson here, sometimes even when you do you best, you fail and have to start over because you didn't follow directions, failed to understand, etc. Happens in life all the time. The main problem is with communication. Teacher to child, Parent to teacher/school, it's needs some improvement. Set up some time and communicate with the school/teacher. Express your concerns about the assignments and erasing homework. In this case, I would ask the teacher not to erase, but merely point out and explain the error(s) clearly, and staple some blank pages to the original assignment if it needs a complete redo. That way, the child can see the wrong and right way and the original effort would not be lost. Explain that you and your child value effort, even if it is wrong and by erasing that effort you are undermining the child's desire to learn. Finally, the neatness of the writing should not be enforced at the pre-school level. As long as the numbers are legible and are mostly in the correct boxes/grid, there should be a gold star. Fine motor skills and writing are still developing at this age, so it's not appropriate to ask to redo based on neatness. It is a very braindamaged, oppressive environment. It seems, your shool wants to lifelong convince your child, that work is not okay, because it will be surely destroyed. Don't have illusions: all of the teachers you've met and defended this rule, is actively working against the children and they want a totally crap, dysfunctional society in the future, full with criminals. any lawful or not really lawful matter what you can do. They are actively harming your child, you are in defensive position, even if the law of your country admits it, or not. If somebody is seriously harming your child, you are allowed and should to stop him, it doesn't matter, how. It is a stronger rule as any law. Anything what you do, is better as letting things go as they are. Not the answer you're looking for? Browse other questions tagged pre-schooler homework teacher fine-motor-skills or ask your own question. How can we make the most of Parent-Teacher consultations? What can I do to get my 5 year old to have respect and self control? How can I handle a situation with a faulty, cruel teacher that does not like me and takes it out on my child? From what age should I require the child to complete her homework? 14 year old not turning in homework?